The Perseid meteor shower, one of the most impressive meteor shower of the year, peaks this weekend–and, this time, it coincides with a new moon, meaning it should be all the easier to spot shooting stars. On the other hand, some area skies will be dealing with smoke and haze from the fires across the state, so be sure to check the latest wildfire updates before you head out, and stay safe. Even if it weren’t for the blazes, Angelenos would still need to drive a bit to get the clearest view of the extra-terrestrial fireworks. Here are some of the best places to spread out your blanket and enjoy the show. Oh, and just a tip, avoid the beach; though sometimes lower on light pollution, the coast tends to be hazy. Nestled up against the foothills, the La Crescenta-Montrose and Altadena areas offer minimal suburban light and decent views. If you only have half an hour to search for your spot, you’ll do fine here, but for darker skies and clearer air, push a little further up Angeles Crest Highway. If you follow Angeles Crest Highway deeper into the mountains, you’ll arrive at Mount Wilson. The Observatory will be closed to the public, but the parking lot near the top and the turnouts along the highway provide ample spots to stop and watch. Templin Highway near Castaic is a popular area for stargazing. A little under a mile after you exit I-5 onto Templin, you’ll come to a shoulder where you can park and join your fellow astronomically-inclined. Another stargazing hotspot is Malibu Creek State Park in the Santa Monica Mountains, which offers places to park and overnight camping. Just remember that, if you’re not staying for a camp-out, this might not be the spot for you; they lock the gates at 10 p.m.
Mount Pinos in Frazier Park offers spectacular night sky viewing. This site is rather popular with astrophotographers, so the unspoken etiquette is to approach the parking lot at the top of the mountain with your lights off so you don’t blow anyone’s shot. Indian Cove campground in Joshua Tree offers comfy camping (bathrooms! paved roads!) and beautiful views of the starscape over silhouetted rock formations. 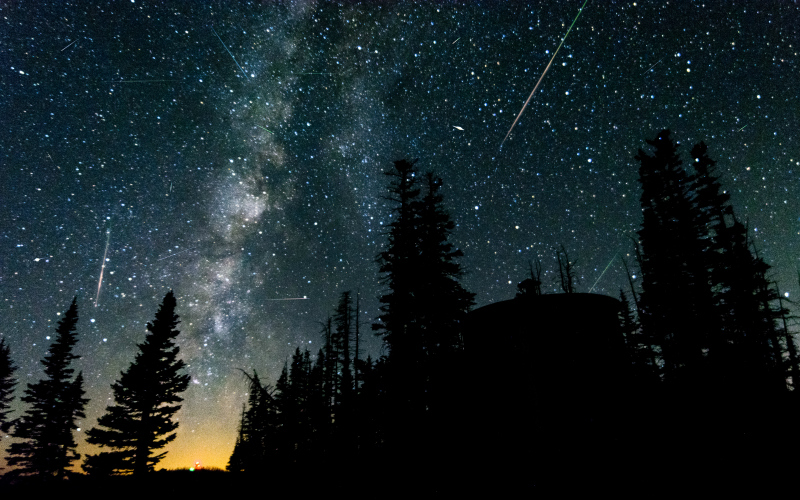 Add meteor-gazing to a getaway to Big Bear, even when it’s not ski season. At the mountain’s elevation, atmospheric distortion is almost non-existent, so settle in and enjoy the sight of an estimated 120 meteors a minute. How to Have the Ultimate Fall Even When You’re Stuck in Seasonless L.A.